Q20. When a regulator bypass test is being performed, what type of voltage is used to excite the rotor field? Identify starting-circuit components, their function, operation, and maintenance procedures. The internal combustion engine is not capable of self-starting. Automotive engines (both spark-ignition and diesel) are cranked by a small but powerful electric motor. This motor is called a cranking motor, starting motor, or starter. The battery sends current to the starter when the operator turns the ignition switch to start. This causes a pinion gear in the starter to mesh with the teeth of the ring gear, thereby rotating the engine crankshaft for starting. The typical starting circuit consists of the battery, the starter motor and drive mechanism, the ignition switch, the starter relay or solenoid, a neutral safety switch (automatic transmissions), and the wiring to connect these components. 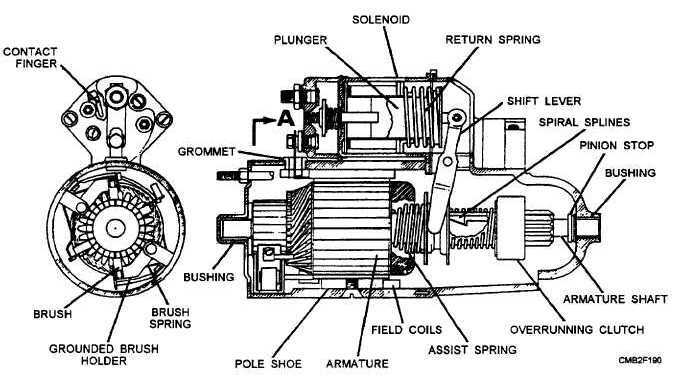 The starting motor (fig. 2-37) converts electrical energy from the battery into mechanical or rotating energy to crank the engine. The main difference between an electric starting motor and an electric generator is that in a generator, rotation of the armature in a magnetic field produces voltage. In a motor, current is sent through the armature and the field; the attraction and repulsion between the magnetic poles of the field and armature coil alternately push and pull the armature around. This rotation (mechanical energy), when properly connected to the flywheel of an engine, causes the engine crankshaft to turn. ARMATURE ASSEMBLY - The windings, core, starter shaft, and commutator assembly that spin inside a stationary field. COMMUTATOR END FRAME - The end housing for the brushes, brush springs, and shaft bushings. Figure 2-37. - Typical starting motor.